Quality, style and resilience come together in our cafe banners. Single and double-sided versions are available. Please ask us about component mix to get the exact kit you need. Cafe banners offer a superb, cost effective way of creating an enclosed area for your customers while looking extremely stylish and high end. £28.00 need help? contact us! Cafe banners come in single- and double-sided versions. Good quality chrome components make these units a credit to any cafe or pavement. They not only provide advertising but also section of an area so people know where to sit. 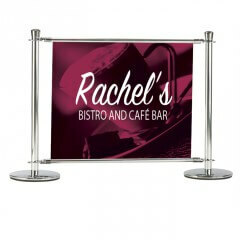 Cafe banners can aslo be good to organise queue while providing point of sale advertising. Established in 1993, Fresco sells good quality banner stands at the best possible prices. All our displays are backed up by helpful support. All of our cafe banners are printed and finished in the UK by Fresco. Our premium quality banner printing uses the latest print technologies. Fresco can meet the tightest deadlines on exhibition displays with our total in-house capability and wide experience. And as a green and cost-effective alternative Fresco offers a full re-graphic service. 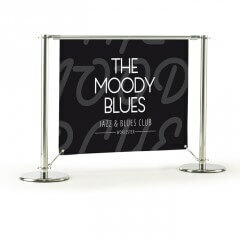 We can fit a new print into almost any type of cafe banner stand, almost any kind of portable display come to that.